Getting back prenatal figure is always a challenge for new mums, even for the fittest mums. We know that the last thing on your mind between feeds and sleep is workout, hence we created a special Pilates Postnatal Weight Loss PlusTM routine that focus on whipping you back into shape FAST! Postnatal Weight LossTM Class is specially designed for new mums to aid sustained weight loss, improve endurance of arms and back muscles to carry the baby as well as to strengthen postnatal pelvic floor and abdominal muscles. New mums need to enhance their core strength to prevent nasty back, arms and shoulder aches from bending over to care for the baby as well as carrying the baby over prolong periods of time. Never tried Pilates before? Sign Up our Trial Class Today! How is Postnatal Weight LossTM Class different from the regular Weight LossTM Class? Postnatal Weight LossTM Class focuses on the muscles that may be weaken over the course of the pregnancy especially the deep abdominal and pelvic floor muscles as well as muscles that are required for new mums to care for their baby such as back and arms muscles. Also, we understand that new mum’s body is still recovering from the pregnancy and thus we ensure that the workout is challenging yet not too strenuous. New mums may combine Weight LossTM Class with Postnatal Weight LossTM Class to achieve optimal results. Hi, is the postnatal weight loss programme suitable for caesarean mummy? Im currently 5 weeks from caesarean. Please advice on the class schedule and fees too. Postnatal Weight Loss Pilates class is suitable for c-sec mums. However, it is recommended to start classes 6 weeks from child birth or with your doc’s permission. 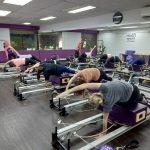 You can join in any of Weight Loss or Body Aches class with Reformer Introduction as your first class. Thereafter, you can progress to our classes. First class is at $30 per person. We have various bundles to meet different needs and can share with you after your trial session. You can also purchase our Christmas Vouchers – 3 classes at $115. Hope to see you in class soon!